Mysterious, vibrant, historical & a-must-see in a lifetime! Magically curved around the imposing volcanic landscape of Caldera,Santorini stands out for its majestic beaches with black sand and colorful lava rocks, important archaeological sites from 3.600 years ago, atmospheric gourmet restaurants, intense nightlife, luxurious hotel units carved into the impressive volcanic cliff offering stunning views, as well as picturesque whitewashed houses and blue domed churches which make it undoubtedly a unique Greek travel destination. Santorini has a compelling landscape, turbulent history, cosmopolitan atmosphere, unique local products and wines that grow on fertile soils, exquisite gastronomy and romantic atmosphere, attracting millions of visitors every year, ranking Santorini to one of the top destinations for visitors all over the world. 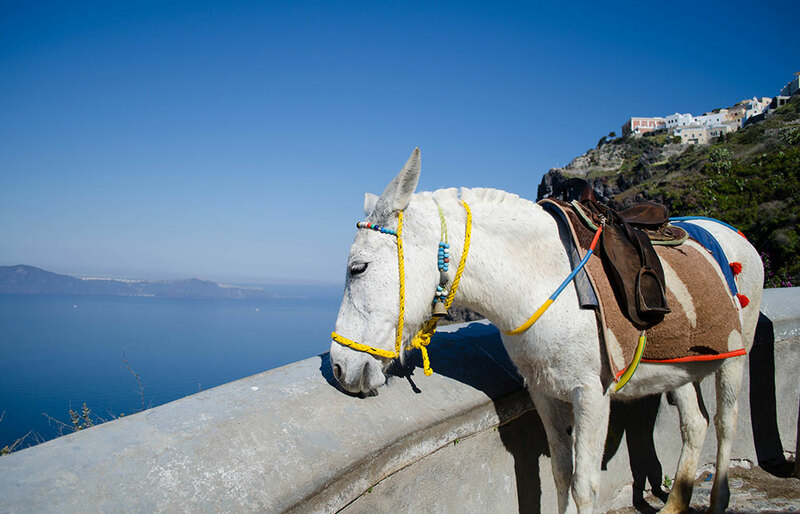 The magic and romance of the island’s wild scenery have blended into Santorini’s lifestyle and touristic development. Everything in Santorini is atmospheric, from its low-lighted restaurants and romantic hotels with private infinity pools and Jacuzzi tubs, to its narrow paved streets and its famous breathtaking sunsets. People from all over the world come to Santorini to get married or renew their love vows over the view of the majestic Caldera. Naturally one of the top destinations of the world couldn’t have anything less than highly developed touristic facilities. 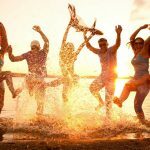 Some of the world’s best hotels and accommodations, budget family run units, art galleries, atmospheric restaurants with exquisite cuisine, traditional Greek taverns, lava made jewelry and souvenirs, local delicacies and exciting nightlife that suits all tastes (pop or latin bars, vibrant beach parties etc.) are found on every corner. Holidays in Santorini can be easily combined with most other islands as there are several daily flights from Athens and the ferry connection is frequent. 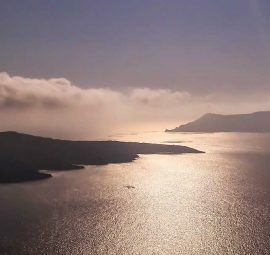 There are also many charter flights to Santorini from abroad, making it easy to visit this unique Greek paradise. 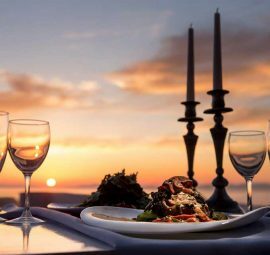 Whether you are interested by the incredible history or you want to admire the most romantic sunset in the world with your beloved, Santorini is a place you will never forget. Santorini’s Volcanic Caldera - Santorini’s Volcanic Caldera is one of world’s natural wonders and the most important geological configurations. 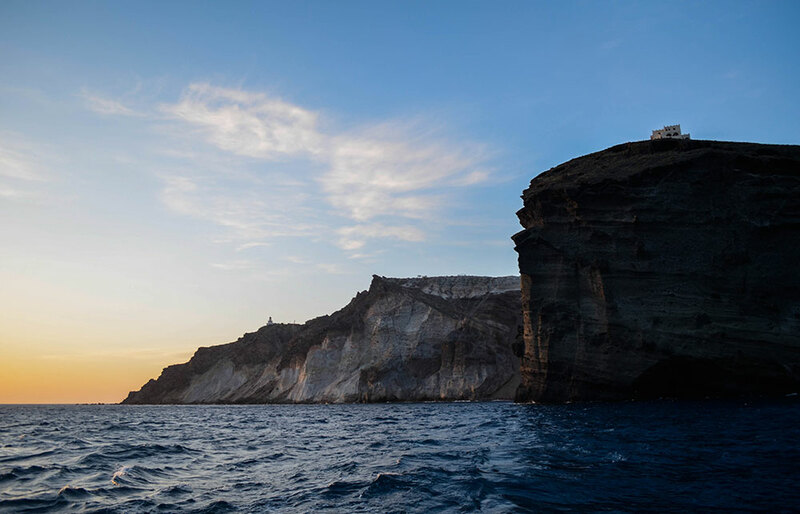 3,600 years ago, the centre of the island was blown away in a massive volcanic eruption, leaving behind three islets (Nea Kameni, Palia Kameni and Thirassia) and the crescent – shaped Santorini.The Caldera of Santorini is actually a basin, four miles in diameter and still active. 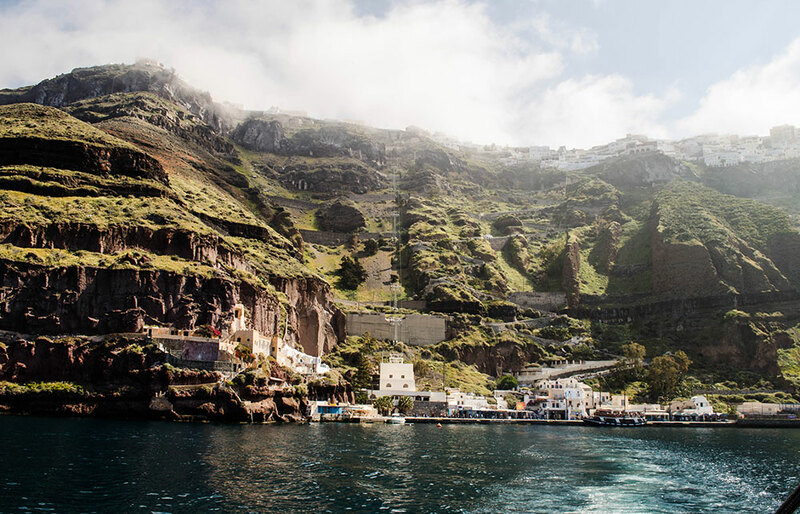 The best spots to view Caldera are on the walking path between Fira and Oia and the numerous hotels, cafes and restaurants situated on top of the cliff on this route. Any visit in Santorini should include a cruise to the volcano. 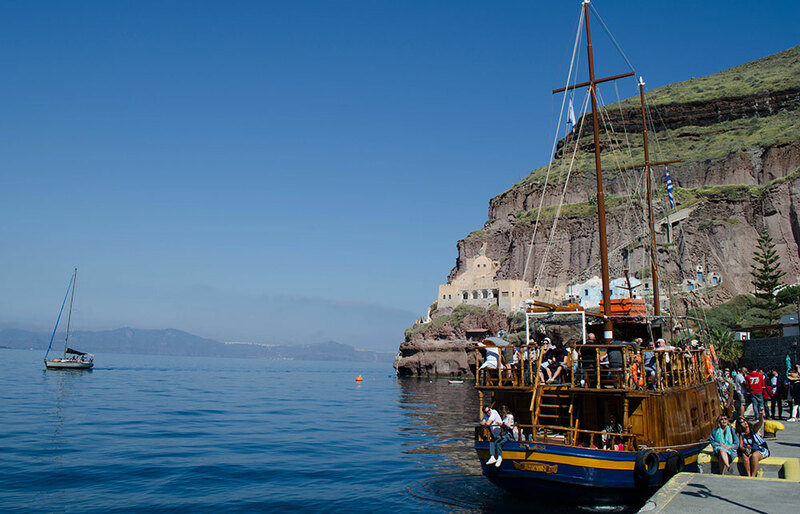 The boat leaves from the old Port of Thira at the bottom of Caldera cliffs. To reach the old port, you can walk down the 588 stone steps, hop on a mule or take the cable car from the top of the cliff. 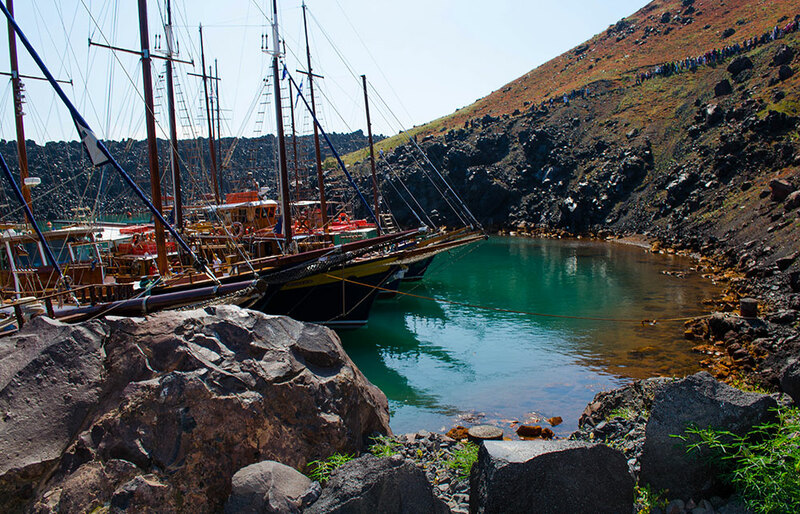 In this 6 hour trip, the visitors explore and walk on the barren, out of this earth Caldera sight, swim in its hot therapeutic springs and eat fresh grilled fish along the crystal waters shore of the picturesque and secluded Thirassia. Akrotiri Minoan Site - The Minoan town of Akrotiri is one of the most important archeological sites of the Aegean. It is located on the southern side of the island, between the village of Akrotiri and the famous Red beach. When the volcano erupted around 1,650 BC, the ancient settlement of Akrotiri was covered with ashes and lava, which preserved it almost intact through time. Excavations have revealed tools and everyday life objects but no human casualties, leaving the archaeologists to believe that precursory earthquakes made the residents leave before the volcano erupted. Museum of Prehistoric Thera - The Museum is located in Fira and exhibits a very large number of ancient artifacts from various excavations on Santorini (Akrotiri, Ancient Thera, Potamos etc). Skaros Rock - In early days,Skaros used to be the capital of Santorini. On this conical remote rock there was a majestic castle and a densely populated Catholic settlement of 200 houses that were situated here until the beginning of the 1800s. The castle was severely damaged from the earthquakes during the eruptions of 1650, 1701 to 1711, and 1866 to 1870 andabandoned in the early 1800s. The path to Skaros Rock originates from Imerovigli. Its stunning landscape and breathtaking view definitely deserve a visit. Santorini Wineries - Santorini has one of the world’s longest traditionin wine-making and some of the oldest vineyards (excavations reveal findings of 3.500 years ago). 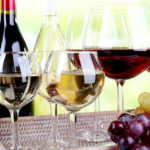 It has 14 different wineries that produce and export wine all over the world. The volcanic soil and the dry land of Santorini give a great taste to all agricultural products (such us tomatoes, vineyards, split peas). The Asyrtiko, Mezzo, Nychteri and Vinsanto are few of the local varieties you will find in cellars all over the world which Santorini is famous for. 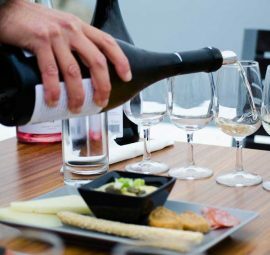 A Wine tasting tour offered on the island is a must – you will learn the secrets of the great vineyard of Santorini, uncork the full flavor of the local wines, try local beauty products from grapes, visit winery museums and unfold the beauty of the island of Santorini. World Famous Sunset - Santorini is particularly famous for the sheer beauty of its sunset views. Its surreal view of the sun dipping into the endless Aegean Sea while painting the sky and the sea in beautiful, purple, orange and pink colors can be savored from many positions on the island. The most famous spot in Santorini is the picturesque village of Oia, where people from all over the globe gather every dusk in the colorful alleys of Oia to enjoy the inspiring sunset. The view is so rewarding that the visitors applaud at the moment when the sun vanishes behind the sea. Ancient Thera - The archaeological site of Ancient Thera is located on the top of a 369m cliff above Kamari and its steep slopes plunge to coast at Kamari to the north side and Perissa to the south offering incredible views over the eastern coasts of Santorini . The Ancient Thera site offers unique historical ruins from the Hellenic, Roman, and Byzantine periods of the Aegean Civilization.The ruins include temples, houses with mosaics, an agora (market), a theatre and a gymnasium. 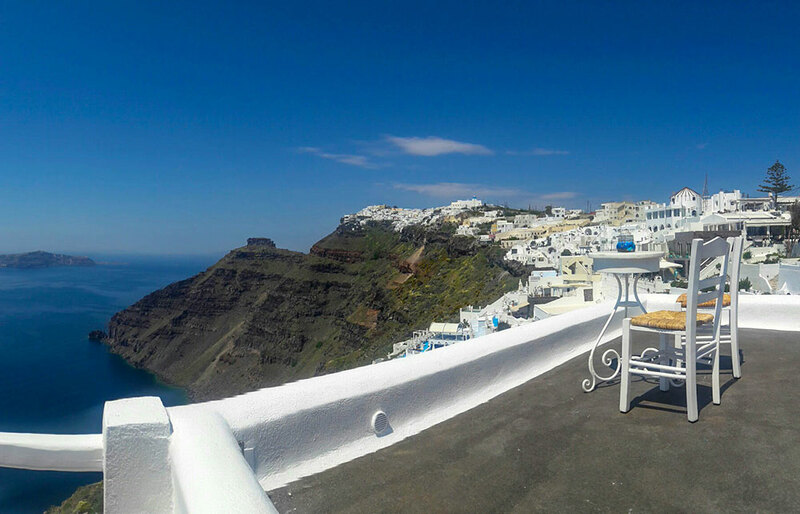 Fira is the capital of Santorini, and is t is perched on the edge of an impressive cliff of 260 meters, offering incredible panoramic view of the volcano. The town is full of whitewashed houses of traditional Cycladic architecture, small paved alleys, blue domed churches and sun-bathed verandas. Fira is the busiest touristic area in Santorini with all kind of shops, restaurants, bar and cafes a visitor may ask for. It also offers many museums and sites to visit. 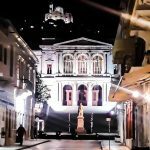 Here you will find the Archaeological Museum, the Prehistoric Museum and the Folklore Museum. 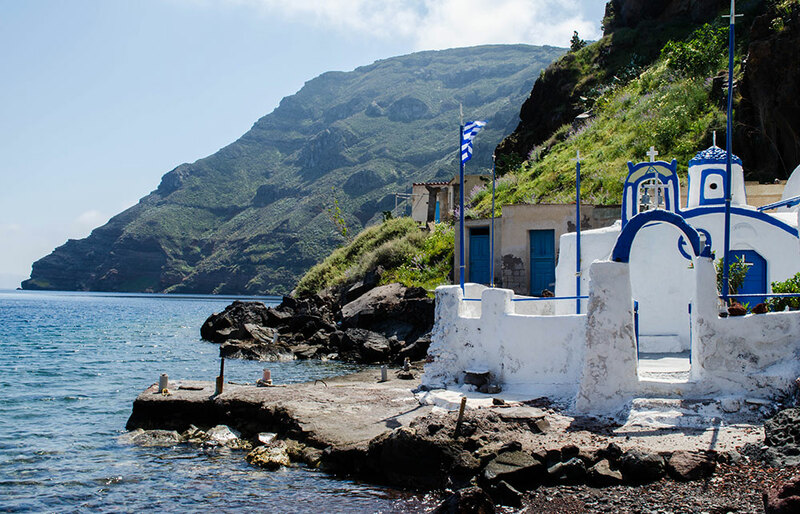 Imerovigli is a picturesque village two kilometers away from Fira. It’s a continuation of Firostefani and one of the most beautiful villages of the islands that offers the panoramic view of the Caldera. In fact, its name comes from the world “vigla” which means view spot. Here you will find many hotels, tavernas and cafes with stunning views. In front of Imerovigli lies an impressive rock called Skaros. Which used to be a majestic castle built in the 13th century and abandoned in the beginning of the 1800’s. 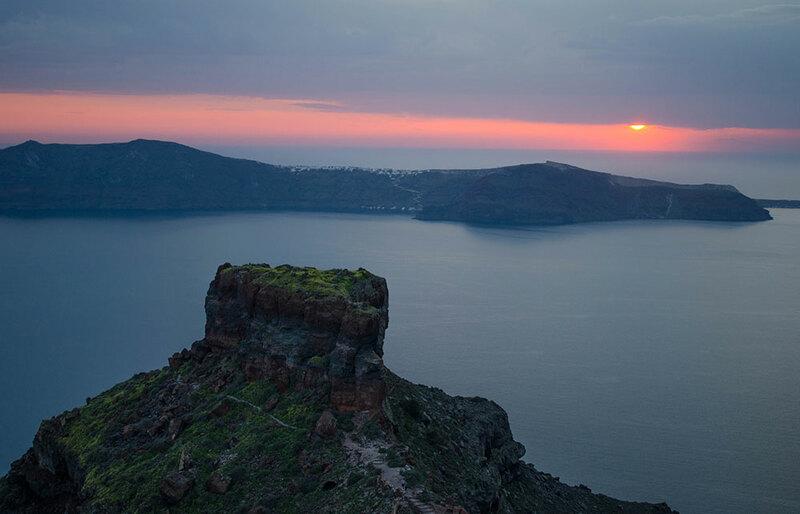 On this huge rock you will see ruins of the castle’s impressive views of the volcano and Santorini island. The village of Oia is one of the most photographed places in the world. 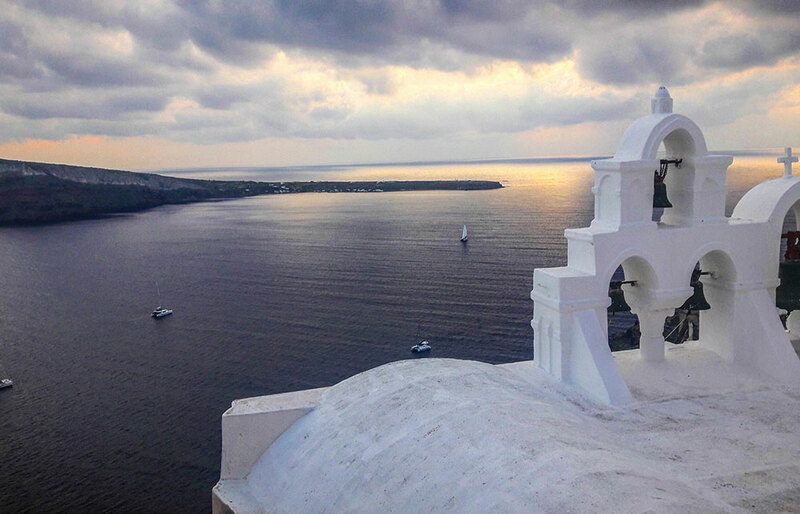 The legendary Oia sunset alone attracts many thousands of tourists from all over the world every year. Here the picturesque whitewashed Cycladic architecture is blended with color splashes of ochre, early red, oyster pink, and green and offers a truly uniquescenery. As you walk to the main marble street of Oia you will get a strong essence of luxury. Oia’s amenities in terms of boutiques, handicraft shops, high-end restaurants, cosmopolitan bars and clubs, are the most versatile on the island.It is definitely one of the best and most expensive places to stay while in Santorini. Megalochori village is the heart of the island’s wine history. The village is famous for its vineyards and wineries that extent beyond the countryside and offer a magnificent setting and the top quality wine of Santorini. Here you can visit some of the most well-known wineries of Santorini, such as Boutari, Gavala and Antoniou. This unspoiled traditional village offers a nice mix of white Cycladic houses, churches and narrow alleys and looks very different than the rest of the villages in Santorini. A horseback riding is a perfect way to experience this village virtually untouched by tourism. The volcanic nature of Santorini has created a unique environment, making its beaches completely different from anything else you will see in the Aegean. Here you will see black and red beaches that resemble lunar landscapes, variety of organized beach facilities and cosmopolitan atmosphere. 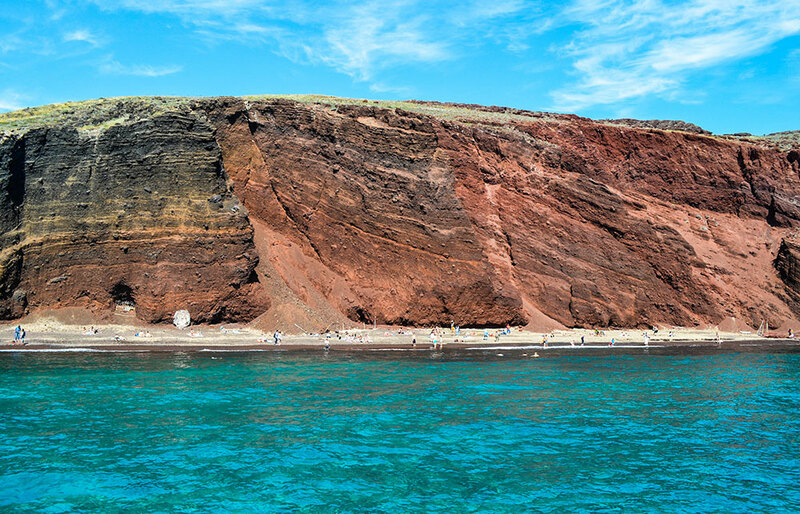 Red Beach is one of the best known beaches of Santorini. It is located close to the ancient site of Akrotiri and surrounded with red and black volcanic cliffs, dark sand and volcanic pebbles on the seashore. You will find many umbrellas and sea beds and two snack bars. The access is relatively easy by foot. You can also access the beach by boat from Akrotiri port. Perissa Beach is the longest beach of Santorini. The beach features unique characteristics, black sand, crystalline waters and fully organized beach bars, taverns and cafes right on the seashore. Perissa village is fully organized in terms of accommodation and entertainment, and is preferred by the visitors that wish to stay somewhere more economical than the Caldera settlements. Vlihada Beach resembles a lunar landscape. It is quite long, composed of dark grey sand and surrounded by high cliffs. Although there are some sun loungers here, it is ideal spot for privacy for those who prefer less crowded beaches. 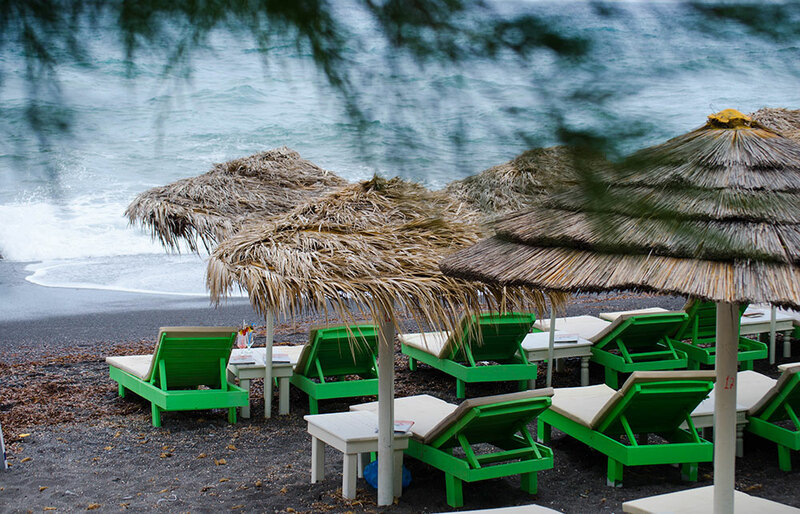 Perivolos Beach is an extension of Perissa beach and consists of a very long well organized beach, with black sand and sparkling blue waters that offers all sort of facilities, like water sports, chill out beach bars, pubs and taverns serving fish local delicacies. Agios Georgios Beach is at the end of Perivolos beach and is preferred by those looking for a bit of quiet away from the big crowds but in an organized manner. 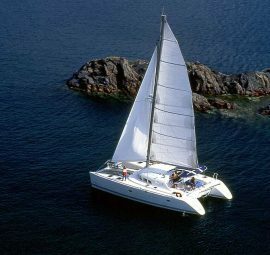 Numerous facilities are available, such as umbrellas and sea beds, water sports, hotels and bars. 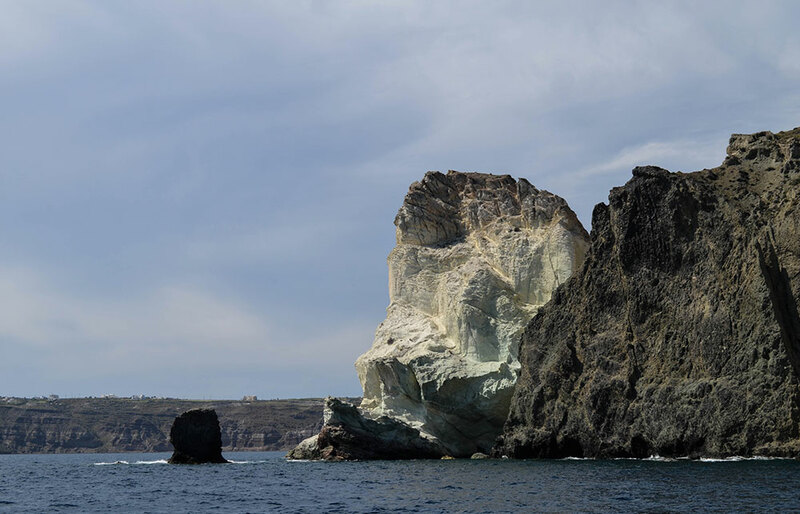 Kamari Beach is famous for its impressive view of the Mesa Vouno rock that is rising from the sea. The beach is very attractive during the night also, when the huge rock shines in the dark. The long black sand beach is very organized offering a wide range of activities, restaurants, beach bars and shops. Columbo Beach is characterized by many as one of the most beautifulbeaches in Santorini. It is an unspoiled long black sandy beach with pebbles, surrounded by enormous red cliffs and beautiful natural environment. The beach got its name from the active underwater crater nearby and the waters are really hot. The beach is quite isolated and unorganized. There is no cantine or restaurant nearby. White Beach is right next to the Red beach, and is very famous for its magnificent scenery. It is has pebbles on the shore and is surrounded with impressive white cliffs. It is less popular and less crowded than the Red beach, has few sun beds and umbrellas but no other facilities. Due to its deep waters it is not preferred by families. Through the ages, Santorini has been known as Strongili “The Round One”, due to is particularly round shape back then, Kalliste “The Fair One”, due to its natural beauty, Thira or Fira, after the commander Theras, son of Autesion of Sparta, who lead earlier colonists to Kalliste and finally Santorini, after the AgiaIrini Byzantine church. Santorini has often been connected with Atlantis, the legendary continent that plunged to the bottom of the sea while it was at its zenith. Finds from the excavations at Akrotiri have led scholars to conclude that the lost Atlantis was none other than Santorini. However, there is still much debate on the subject. The first human presence is placed to the Neolithic Period. Around 3500 BC excavations suggest that the Red Beach and Akrotiri was home to a Minoan colony. In 1500 BC the island, which back then was called Strogilli (round) was the victim of a huge volcano eruption that most probably was the main cause of the destruction of the great Minoan civilization on the island of Crete, 70 nautical miles away. In 1300 BC after the loss of the Minoan culture, the Phoencians settled in the island. In 1100 BC the island was occupied by the Laconians from Pelloponnese region. During the Hellenistic period the island grew in importance and became an important naval base, due to its strategic position in the Aegean. In 1200 AD the Byzantines, and then the Venetians, took control of Santorini for almost 4 centuries. The name of the island was given by the Venetians after the Santa Irini, the name of a catholic church. In 1579, the Turkish Rule followed and the island succeeds in trading development with the ports of Eastern Mediterranean. The period that follows is quite prosperous. In 1830 Santorini Island was integrated to the newly established Greek State, a date that marked the beginning of a new and prosperous commercial era. In the 1970’s the tourist development begins and today the island is one of the top tourist destinations in the world. Santorini is famous for its products all over the world. The volcanic ashes have made the soil extremely fertile and bring a unique flavor to the local products which stand out for their excellent quality. The most typical products produced in the volcanic earth is fava, delicious cherry tomatoes, white eggplants, caperberries (kapari), katsouni (a type of courgette), saffron and Santorinian chloro cheese made out of goat’s milk. Santorini’s most typical local dishes are Meletinia, a traditional Easter sweet cheese pie out of fresh myzithra cheese, sugar, cinnamon and mastiha and pie dough, Ntomatokeftedes (tomato balls), Santorini pudding (a dessert made of semolina and milk) and Sfoungato (omelet with courgettes, potatoes and tomatoes) a Santorini classic! There is an old saying that: Santorini has more churches than houses and more wine than water. The religious feasts in the island as in the most places in Greece are prepared with great love and respect to tradition. Every village has it its own customs and patron saint which they usually celebrate with various ceremonies including cooking and decorations. In Easter the religious celebrations are very special all over Santorini, with the most spectacular (or particularly known) of all that at the mountain top of Pyrgos village on Good Friday. Aghia Matrona (October) - It takes place in Oia and locals celebrated Saint Matrona with food, dance and live music. One of the oldest and most popular feasts of Santorini. Good Friday in Pyrgos (Easter) - In Pyrgos on the Good Friday night (Epitafios) its villagers do something really special to mourn the death of Zesus Christ. They light upthe entire village with candles (no less than 25.000 candles in every rooftop of every house, church, and path). This magnificent spectacle seems to fire up the entire village. 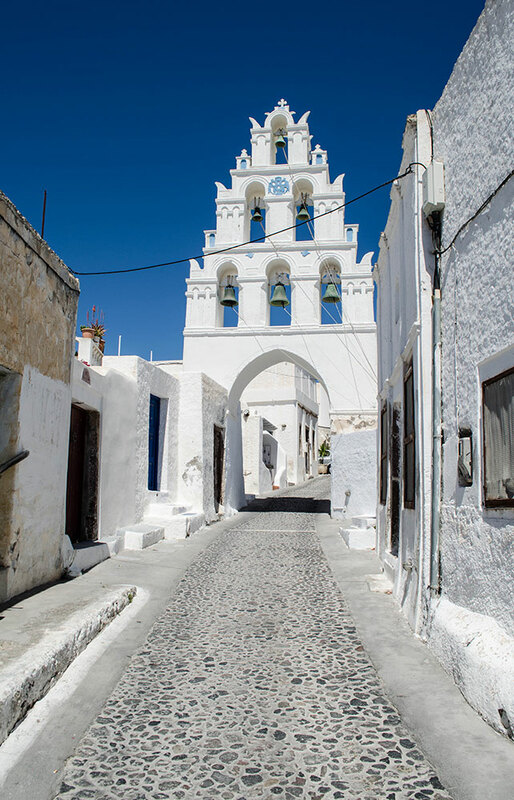 As Pyrgos towers over the rest of the island, it is a spectacle that cannot be missed. From far away it looks like a burning village, but as you get closer and walk through its narrow lighted alleys, it is a truly magical and touching sight, a must see! Panagia Trypa (February) - It takes place in Vothona. A big local feast with food and celebrations. Virgin Mary (August 15th) - The traditional celebration in honor of Virgin Mary takes place in the church of PanagiaEpiskopi. This is the biggest celebration of Santorini with food and wine distributed to the people. Ifestia Festival (August) - It involves the dramatic representation of the volcanic eruption in Santorini with fireworks and sounds and a series of interesting events, concerts and dance performances. International Music Festival (September) - It welcomes famous international artists who perform for two weeks in Fira, at the Petros Nomikos Conference Center. Megaron Gyzi Festival (August) - It includes mostly jazz and classical music concerts art exhibitions in Gyzi Cultural Centre in Fira. Parkour the Red Bull Art of Motion Festival - It is frequently organized in Santorini attracting many free runners from the entire world and a large deal of attention on the island. Santorini Arts Factory - A non for profit organization hosts every year acclaimed artists from all over the world and organizes art exhibitions, theatrical and musical performances, dance workshops and art events. Santorini Jazz Festival (July) - It takes place in Kamari and attracts jazz lovers from all over the world, since it includes performances from famous Greek and International jazz artists. The Arkadi Syllogos - Every year the Society of Cretan in Santorini organizes an series of events, dance performances and concerts.